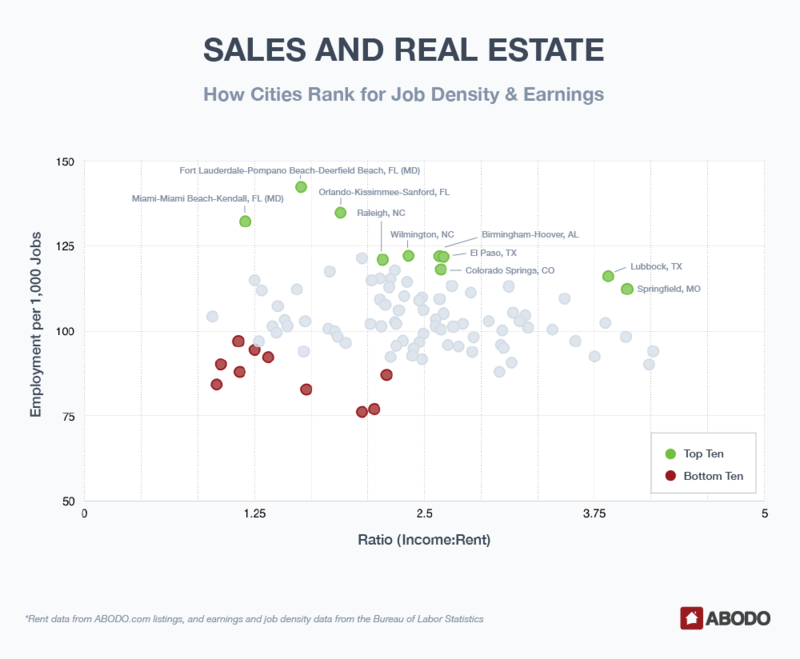 As part of a series looking into the best metros for various occupations — based on where the most jobs are and how affordable rental housing is compared to median wages — apartment listing site Abodo released an analysis of the top Metropolitan Statistical Areas (MSAs) for individuals working in sales and real estate. Using data from the Bureau of Labor Statistics, Abodo examined job concentration and income-to-rent ratio for this labor sector — which groups together real estate agents and brokers with other sales professionals, for example, those working in retail, manufacturing, insurance, finance as well as news and street vendors. In Fort Lauderdale, sales and real estate pros have a job density of 142.38 jobs per 1,000 (the highest on the list), a median annual wage of $28,080, and a median rent of $1,469 for a one-bedroom apartment. In Orlando, there is a job density of 134.79 jobs per 1,000 (no. 2), a median annual wage of $24,470, and a median rent of $1,083. In Lubbock, Texas, which rounded out the top three, sales and real estate professionals have a job density of 116.04 jobs per 1,000, a median annual wage of $25,430, and a median rent of $550 — one of the lowest on the list. In New York-Jersey City-White Plains, NY-NJ and Washington-Arlington-Alexandria, DC-VA-MD-WV, workers are earning 94 percent and 97 percent of what median rents cost. Professionals in the San Francisco area are breaking even despite having the highest median annual wage ($38,950), and those in Oakland-Hayward-Berkeley, California; Boston-Cambridge-Newton, Massachusetts; and Miami-Miami Beach-Kendall, Florida, are doing just a little better than their counterparts in San Francisco. Despite these factors, Ann Arbor, MI, Washington-Arlington-Alexandria, DC-VA-MD-WV, Durham-Chapel Hill, NC ranked last on the list, with scores of 0.85, 0.94 and 1.01, respectively. Although Ann Arbor had a relatively strong median annual wage ($27,960) and a pretty affordable median rent of $1,131, the jobs density was the lowest on the list (76.10 per 1,000). Washington, D.C. had a slightly better jobs density (84.17), but workers had one of the highest median rents ($2,453) while only making an annual salary of $28,430. Durham-Chapel Hill, much like Ann Arbor, ranked relatively well when it came to annual wages ($27,560) and median rent ($1,079), but the job density was 76.9 per 1,000, one of the lowest on the list. We used 2016 data from the U.S. Bureau of Labor Statistics on employment per 1,000 jobs and median annual wages for all sales and real estate occupations by metropolitan statistical area. Wage data is for all part-time and full-time workers who are paid a wage or salary. Annual median wage is calculated by multiplying the hourly median wage by 2,080 hours. We paired this income data with ABODO data on median one-bedroom rent prices. To calculate the income-to-rent ratio for each MSA, we divided the median annual wages by 12 to get a median monthly wage, then divided the result by the current median 1-bedroom rent price for the area. We then scaled both the employment per 1,000 jobs and the income-to-rent ratio to give each a relative value between 0 and 10. The final score is a weighted sum of the scaled values, with employment per 1,000 jobs carrying a 75% weight and income-to-rent ratio 25%.